Rehabilitation is one of the most important stages for a cochlear implant recipient on their journey to hearing. Hearing specialists and the right rehabilitation materials can help you learn to hear better, communicate effectively, and reconnect in all areas of your life! You may recognize the name Donna Sperandio on our MED-EL Blog. Donna regularly shares rehabilitation Tips and Tricks in our Friday slot. She is the Head of Rehabilitation at MED-EL, working with hearing specialists across the globe, and developing materials and trainings designed to help a CI recipient get their best possible hearing experience. 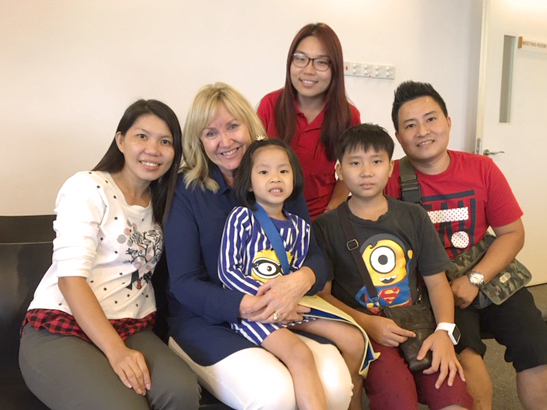 She and her team support cochlear implant recipients in over 100 countries, from Myanmar, to Canada, to the UAE! We learn from Donna about why rehabilitation is such a significant part of the journey to hearing. Thanks for talking with us, Donna! Why is rehabilitation important? The cochlear implant is just the first part of the process—it opens the door to hearing. But, support is needed after that to train the brain to understand sounds. This then allows listening and spoken language to develop. Language is your connection to the people around you. If you can provide a cochlear implant to a child and they can develop spoken language, they can have a wonderful life. They can communicate with their family and friends, get an education and pursue their passions or career. For adults, they have the chance to reconnect with families, friends, take on new hobbies and thrive again at work, all of which might not have been possible without restored hearing. My first contact with people with hearing loss was when I began my working career as a preschool teacher in Christchurch. There, we also had children from a school for the deaf who had special teachers with them. I thought that looked like a really interesting job so I applied to do a course to become a teacher of the deaf. Some years down the track, I worked in cochlear implant programs around the world. I then completed my Masters and became a certified Listening and Spoken Language Specialist. MED-EL has recipients in over 100 countries worldwide. How do you give support to recipients in so many different places? I think we are very committed to a global perspective as a company. We have materials in 39 languages and are working towards producing materials in braille. MED-EL also employs rehabilitation and hearing specialists around the world. It makes no difference if we get a request from developing countries where there is little available and has just a small number of implant recipients, or if we get a request from a developed country. For example, earlier this year we went to Myanmar during the wild, wet season. We sat in a room training therapists despite experiencing a blackout for hours and major flooding occurring outside. It was a great feeling to see the joy from the therapists, who were grateful that a cochlear implant company like ours was willing to come and support them. What I truly love is that our hearing specialists are able to support a huge number of people right across the globe. We offer rehabilitation materials and training to professionals worldwide, including workshops, trainings and seminars. The programs are usually for hearing specialists such as audiologists and therapists, but also sometimes for parents about how to help their child get the most out of their cochlear implant. Just this year alone, our team has supported events in countries including Brazil, the Middle East, the USA, Canada, Australia, Thailand, China, Japan and the UK. Was there a story of a cochlear implant recipient that was really special for you? I once met a two and a half year old girl in Malaysia called Penny, who had just received her cochlear implant. I did a demonstration rehabilitation session with her, which is something we sometimes do to show ways of working with children to parents and professionals. Two years later, when we were at another event in Malaysia, four-year-old Penny and her mother traveled to the event just to show me what Penny is now capable of. Penny can talk, sing and read, and is going to school. It was such a wonderful feeling to see how far she has progressed and to see how happy her family is! What advice do you give to someone who is beginning the rehabilitation process? I would remind them to be patient. Be aware that it can take some time before you get the maximum benefit of hearing with your cochlear implant as your brain needs to learn to understand sound. Also, find rehabilitation activities that are enjoyable because you need to do a lot of practice. Learning is maximized when people are having fun! To a parent, I would say to trust their instincts, and remember that they are the most important person in the process. Find a program or hearing specialist that puts you in the center of your child’s learning. Children need to be in a rich language environment in all of their waking hours, and parents are the best people to ensure that. Firstly, they are there all the time, and secondly, children learn best from the people that love them. Parents tend to look a long way into the future, such as “will they be happy, will they learn to talk, or go to school, or make friends”. For a profoundly deaf child, with the right rehabilitation, a cochlear implant has the potential to allow all of those things. What have been the major developments in rehabilitation? The use of online materials and digital platforms today are enabling people to connect more than ever. It’s one of the things I love about writing for the MED-EL Blog—it’s our way of connecting with many people around the world. It’s fantastic because people are able to access info and support from wherever they are, including advice from other recipients like on HearPeers. At the moment we’ve got five apps all available on tablets, one of which—Continents and Oceans—is also available on smartphones. These five apps are designed to provide support both to professionals and patients. One app is HearToday, which gives ideas for rehab in everyday life at home. Another is the MED-EL Rehab Bookshelf, which gives an overview of many materials and access to e-books. What direction is rehabilitation going in the future? We’re moving more into the digital and online world because that’s our way of helping as many people as possible around the globe. We’re also aiming to connect more with people through social media. So watch this space for more apps, online content and more from MED-EL! Have you got a rehab question for Donna? Leave us a comment below and we’ll make sure it gets answered! Are you an adult with a cochlear implant? Learn why rehabilitation is so important for you! Check out our post on how to be prepared for cochlear implant rehabilitation!